Located just two miles from the Gulf of Mexico, new homes in Palm Harbor are now selling in our gated community of Enclave at Palm Harbor. Perfectly situated due to its accessibility to major employment hubs, entertainment and dining options, highly-rated schools, and close proximity to Caladesi Island, one of the nation’s best beaches. You’ll love our luxurious boutique feel. The life you want to live is waiting for you at Enclave at Palm Harbor. Explore this community and see for yourself. The Nobility offers a space to entertain and relax, with a sunlit formal dining room and a private owner’s retreat. The Camelot delights with an open kitchen, formal dining room, and an owner's retreat off of the owner's suite, when you want to get away from it all. The Gardenside's open concept design allows a natural and easy flow between the gathering room, kitchen, café, and bedrooms. The spacious Heatherton is ideal for entertaining, featuring a large kitchen with oversized island overlooking the great room, café, and covered lanai. The Nobility Grand offers a space to entertain and relax, with a sunlit formal dining room and a spacious upstairs loft. The Camelot Grand offers space to entertain and relax, including a sunlit cafe seating area and private Owner’s Retreat. The Gardenside Grand's open concept design allows a natural and easy flow between the gathering room, kitchen, café, and bedrooms. Explore the possibilities with our seven luxury consumer-inspired home designs. Located just two miles from the Gulf of Mexico, the gated community of Enclave at Palm Harbor is situated in a premier location. Enclave at Palm Harbor is conveniently located just off of County Road 1 and Curlew Rd, making travel time to both St. Petersburg and downtown Tampa approximately 30 minutes respectively. Both the Tampa International Airport and the St. Pete-Clearwater International Airport are less than 20 miles away. Caladesi Island State Park, ranked the #7 beach in the nation in 2017, is just a short two miles drive from the community's entrance. Register Today as a VIP! Coming Soon in the Summer of 2018! 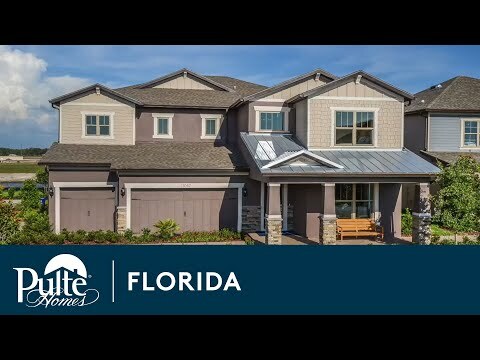 Please watch this video on the quality standards that we implement, when building every Pulte home in our West Florida communities.